This Lavezzi 40 Maestro is a 1 owner boat. 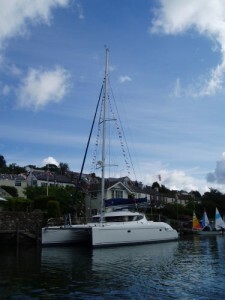 She has been lightly used on the South Coast of the UK and as a result is in excellent condition. Many of the extras were factory fitted including all of the electronics (Radar/Chart plotter/fish finder). Also fitted is an Eberspacher heating system, additional engine bay insulation and a canister life raft. With 12 V Fridge System. 2 Holding tanks for heads. 220V main system with cabin outlets, shore power cable + battery charger. JVC radio / CD sound system + 4 speakers. Saloon Table convertible to berth. Bimini Cockpit tent (side Panels to guard rails). Electric head large size x 2. Additional 240v sockets in Saloon. Saloon curtains and aft bulkhead.